2. Where Can You Go from My Spirit? 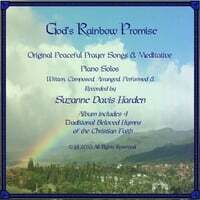 "God's Rainbow Promise" ~Suzanne Davis Harden's debut album features 12 tracks of beautiful, peaceful music that is both soothing and relaxing. The first 4 tracks are comforting prayer songs that are reminiscent of ancient, Gregorian Chants with an ethereal quality that lifts the soul heavenward. The next 4 tracks are beautiful piano solos that seem to echo the music of heaven in their quiet, peaceful melodies. The last 4 tracks are timeless hymns of the Christian faith. Suzanne sings these in a soft, soothing voice that is both comforting and encouraging to the soul. God's Rainbow Promise is an album you will want to listen to over and over again to relax to and bring peace into your heart and home. Suzanne's ethereal voice and spiritual lyrics combine to make a wonderful listening experience for all ages. Her joyous love of God shines through in each selection and brings incredible peace to the listener. Can't wait to hear more from this talented artist. The first of a series of albums, this debut contains delicately arranged melodies joined by Harden's ethereal voice. Highly recommended.